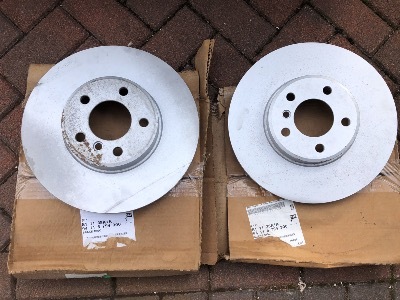 Genuine BMW front brake discs. These discs measure 332mm x 30mm. They fit BMW X3 E83 3.0sd and E53 X5 models. One of these discs has had the rear surface sanded to remove light rust caused by a damp storage location. This will not affect the performance of the disc. The BMW part number is 341167904300. The current BMW part number is 34116859679. Please check this part number against the last 7 digits of your VIN number using the BMW & Mini electronic parts catalogue before buying. If you don't know how to do this, send us the last 7 digits of your VIN number and we will do it for you.